Average insurance rates for a 2000 Honda Civic are $1,002 a year for full coverage. Comprehensive costs on average $120, collision insurance costs $198, and liability costs around $504. Buying a liability-only policy costs as low as $564 a year, and high-risk insurance costs around $2,170. Teenage drivers receive the highest rates at up to $4,190 a year. Rate data is compiled from all 50 U.S. states and averaged for all 2000 Honda Civic models. Rates are based on a 40-year-old male driver, $500 comprehensive and collision deductibles, and a clean driving record. Remaining premium consists of UM/UIM coverage, Medical/PIP, and policy fees. For a driver in their 40's, prices range range from as low as $564 for a discount liability-only rate to the much higher price of $2,170 for a driver who has had serious violations or accidents. These differences show why everyone should compare prices based on a specific location and risk profile, instead of using average rates. Trying to find better auto insurance rates? Buyers have lots of choices when searching for the lowest priced Honda Civic insurance. You can either waste hours calling around trying to get quotes or save time using the internet to make rate comparisons. There is a right way and a wrong way to buy auto insurance so we’re going to tell you the proper way to get price quotes for a new or used Honda and locate the cheapest rates. Consumers should take time to get comparison quotes before your policy renews due to the fact that insurance rates fluctuate regularly. 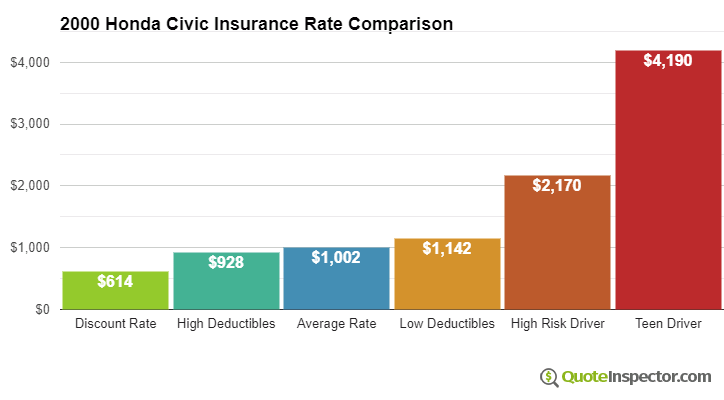 If you had the best deal on Civic coverage a few years ago you will most likely find a better rate today. Ignore everything you know about auto insurance because you’re about to find out one of the quickest ways to find the best coverage while lowering your premiums. The purpose of this post is to help educate you on how to get online quotes and some tips to save money. If you currently have a car insurance policy, you will most likely be able to reduce your rates substantially using this information. Drivers only need an understanding of the proper way to compare rates on the web. There are a lot of ways to compare car insurance quotes, but some are less labor-intensive and much quicker. You could waste time driving to local insurance agents in your area, or you can utilize the internet for quick rates. Most major companies participate in an industry program that enables customers to complete one form, and every company then gives them pricing for coverage. This system prevents you from having to do quote requests to each individual car insurance company. To participate in this free quote system, click here to open in new window. The single downside to getting quotes like this is you can’t choose which insurance companies to get quotes from. So if you want to choose specific providers to compare rates, we have assembled a list of car insurance companies in your area. Click to view list. Which method you use is up to you, but ensure you’re using exactly the same coverages for each comparison quote. If each company quotes differing limits it will be impossible to determine which rate is truly the best. When buying the right insurance coverage for your personal vehicles, there is no best way to insure your cars. Everyone’s situation is a little different. For example, these questions may help highlight if your insurance needs would benefit from professional advice. What is the ISO rating for a 2000 Honda Civic? If you can’t answer these questions but you know they apply to you, then you may want to think about talking to an agent. If you don’t have a local agent, complete this form. It is quick, free and you can get the answers you need. Knowing the specifics of insurance can help you determine the right coverages at the best deductibles and correct limits. The coverage terms in a policy can be confusing and reading a policy is terribly boring. Coverage for liability – This coverage can cover damages or injuries you inflict on other people or property by causing an accident. It protects you from legal claims by others. It does not cover damage sustained by your vehicle in an accident. Split limit liability has three limits of coverage: per person bodily injury, per accident bodily injury, and a property damage limit. You commonly see values of 100/300/100 which means $100,000 bodily injury coverage, a per accident bodily injury limit of $300,000, and $100,000 of coverage for damaged property. Alternatively, you may have a combined limit which limits claims to one amount without having the split limit caps. Liability can pay for things such as emergency aid, structural damage and attorney fees. The amount of liability coverage you purchase is up to you, but consider buying as much as you can afford. Collision – Collision coverage pays for damage to your Civic caused by collision with another car or object. A deductible applies then the remaining damage will be paid by your insurance company. Collision coverage protects against claims such as hitting a mailbox, colliding with another moving vehicle, crashing into a ditch and colliding with a tree. Collision coverage makes up a good portion of your premium, so analyze the benefit of dropping coverage from vehicles that are 8 years or older. Drivers also have the option to increase the deductible in order to get cheaper collision rates. Comprehensive insurance – This pays for damage from a wide range of events other than collision. You first must pay your deductible then the remaining damage will be covered by your comprehensive coverage. Comprehensive insurance covers things like damage from getting keyed, falling objects, fire damage, hitting a bird and a broken windshield. The maximum amount a insurance company will pay at claim time is the ACV or actual cash value, so if it’s not worth much more than your deductible it’s probably time to drop comprehensive insurance. Coverage for uninsured or underinsured drivers – This gives you protection from other drivers when they are uninsured or don’t have enough coverage. It can pay for hospital bills for your injuries and damage to your Honda Civic. Because many people only purchase the least amount of liability that is required, their limits can quickly be used up. This is the reason having UM/UIM coverage is a good idea. Frequently these coverages are similar to your liability insurance amounts.